I previously reviewed Manisha Thakor and Sharon Kedar's book, On My Own Two Feet, and recommended it as a good introduction to general principles of personal finance management and investment. Even then, much earlier on in my personal finance journey, I thought it was a good book but rather basic: Excellent for beginners, but without terribly much payoff for someone with an adequate handle on, say, their credit card usage and student loans. 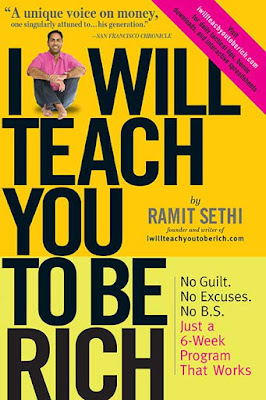 I was recently inspired to read Ramit Sethi's I Will Teach You to be Rich, and I highly recommend it, both to beginners and to readers with some personal finance knowledge. If I had to choose just one, I'd recommend Sethi's book because it is slightly broader in scope. In actual practice, though, the more personal finance knowledge, the better. 50-60% of take-home income to necessities, i.e. groceries, rent, internet, and loan repayment. 10% of take-home pay to investments, and if you're using a pre-tax option like a 401k, add the monthly contributions to your take-home pay to get your total take-home income for calculation purposes. ~10% to other long-term savings goals, i.e. vacations, home-buying, emergency fund. 20 to 35% as guilt-free spending money, including restaurants and coffee shop runs, subscriptions, and so on. Those are just very general guidelines, of course, and there are various steps that he recommends completing before you sit down and draw up a conscious spending plan: Get a handle on high-interest debt, start contributing to retirement accounts, especially if you have an employer match, and so on. Although none of the above sounds too novel, I think there's a lot of value to his larger point that one should say no to mindless lifestyle inflation. Many people don't derive particular joy or utility from things that larger American society or consumer culture might subtly tell us we "need" or are entitled to enjoy, things like the newest smartphone, fancy electronics, the most apartment (or house or car) that one can afford, expensive gyms, and so on. By arguing for conscious consumption, Sethi argues against the unthinking lifestyle creep and "keeping up with the Joneses" mentality that might eventually lead to the woes of the guy in the article I linked in April. Instead, if one is conscious about where their money is going and is paying for the necessities and also saving and investing a substantial percentage (say at least 20% of take home pay plus pre-tax contributions, though I personally aspire to do more - I'm at about 23% saved or invested under his calculations, and I'd love to do better), then one should feel free to use the disposable income that remains in a way that maximizes their happiness. Investments - Although, on further reflection, Sethi doesn't actually go into significantly more detail about basic investment principles than Thakor and Kedar, I came away from reading his book feeling more empowered to explore options besides the S&P 500 index. Of course, being less than creative or adventurous with investing, the extra option I chose is just a Vanguard target-date retirement fund. Negotiation - He offers some very good and concrete tips on conducting negotiations, whether for a salary raise or to get accidentally incurred bank fees refunded. That's just a small portion of the things Sethi covers in his book. Overall, I highly recommend it, even if my own tried and true approach to managing my finances differs from what he advocates. I don't automate my savings and bills because I like doing it manually every month, and he isn't a huge fan of the line-by-line daily budgeting and expense-tracking that I do.